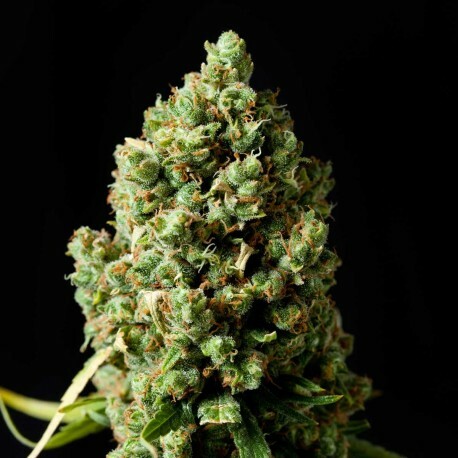 Jack Herer feminized cannabis seeds are well known all over the world and very popular to grow because of its high quality yield and good look. High quality is gained out of a long period of improvement and that is what you'll experience when you grow and eventually consume her delicious buds. Jacky Herer has Red Skunk and Haze genetics that you can find back in growth, looks and effect. The buds have that promising fluffy look because they grow compact and are covered with a nice layer of resin, beautiful orange brown hairs make the buds look even more delicious. Her fresh earthy pine-like smell and taste get your senses going and after a few hits the buzz is starting to kick in real nicely. Gives an intense high feeling that lasts a while although many smokers still manage to get things done, the high is energetic and pure. Jack Herer has been a very popular strain right from the time it was developed and it leads the list of most-wanted cannabis strains amongst smokers and growers. And the feminized version of this strain is notinferior to the original Jack Herer in any way; in fact, it is a must-grow at least once for every serious marijuana grower. Jack Herer feminized shares its genetics with Haze and Red Skunk and you can find similarities in the looks, growth and effects in the course of cultivation and smoking experience. Owing to the extremely high THC content and such vast resin formation that covers even the branches, Jack Herer was the overall winner of 1995 Cannabis Cup. It is undoubtedly an irresistible weed, which is highly popular around the world for its good looks and high yields. The buds exhibit that potential fluffy appearance since they grow compact and are coated with a nice resin layer. The attractive orange brown hair gives a really delicious look to them. The high quality that this variety boasts of is the result of the stretched period of enhancement and this is what you will get to experience when you cultivate this strain and finally consume its luscious buds. The taste and earthy fresh pine-like aroma get the senses of the smoker going and the buzz kicks in nicely following a few puffs. In a nutshell, Jack Herer feminized produces a high and intense feeling that lasts for quite some time, though several smokers still manage to work. The pure and energetic high that it gives makes it suitable for medicinal use. When I asked to be replaced they told me to send the seed thet geminate back. I just finished curing a crop of these tasty buds and am delighted with the smell, size, taste and the great buzz. You simply cannot find any better buds than these. They also have a short, for sativa, time to bud. As my dear mother used to say, "try it, you'll like it"!! When plants start smell? Small plant do not smell... when they start? I like to crow indoor what kind lights i need? É enviado de forma discreta?